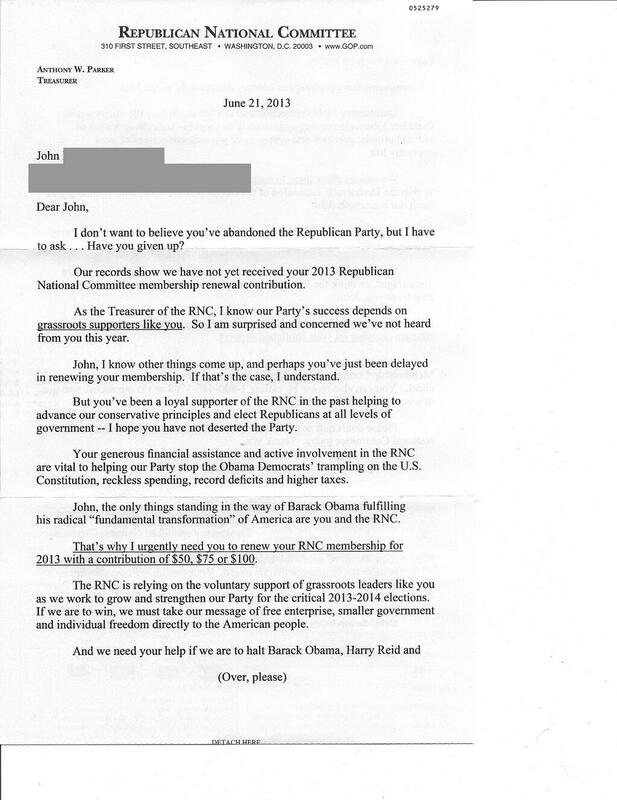 Received a delightful letter from the Republican National Committee. Seems that they are concerned that, well, I’ve gone loco. I’ve got… a problem with this. 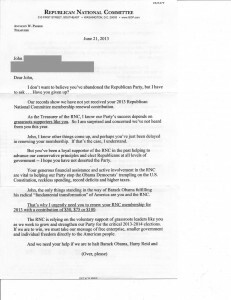 First, I’ve never contributed directly to the RNC. I’ve never been a member of the RNC. I have contributed to individual candidates. But I’ve never contributed to the RNC, the NRCC, the NRSC, the California GOP, or any other party committee or organization. I don’t want to believe you’ve abandoned the Republican Party, but I have to ask… Have you given up? Well, with an approach like this, perhaps I have given up. Besides, I put conservative principals before party, so pushing my nose in my party allegiance sin is no way to get my wallet open. Do you recall what Ronald Reagan, noted former Democrat, said of his party switch? I didn’t leave the Democrat Party. The party left me. – So who, exactly, has given up? I refuse to be complicit with a party that treats me, and my state, as an ATM to fund elections elsewhere, while abandoning our state. As long as there is cash in California, we will continue to hear from the National GOP – what we don’t hear are solutions. Solutions for our state and our nation. We don’t see candidates that are running for something, but candidates that are running against something. Or candidates that are simply running to win an election. Term-limited party retreads, jumping from seat to seat between legislative houses, and then back down to County Boards, because they’ve exhausted the available supply of State-house seats. As the Treasure of the RNC, I know our Party’s success depends on grassroots supporters like you. So I am surprised and concerned we’ve not heard from you this year. That’s a funny way of leveraging the grassroots – by accusing them of abandoning the Party. Besides, doesn’t a real grassroots effort drive the movement, and not the other way around? And you have heard from me, Mr. Parker, you shouldn’t be surprised, but you should be concerned- every fund raising call or email I receive, I indicate that the Party system has failed me, failed my state, and has failed the nation. That I will support candidates, but not the party. What more do I have to explain to the Party so that everyone understands? Further, shouldn’t the Party be explaining to me where it has failed, and how it plans to improve? –I hope you have not deserted the Party. Who has deserted who now? … the only things standing in the way of Barrack Obama fulfilling his radical “fundamental transformation” of America are you and the RNC. It won’t make a difference, you can’t win.